Happy Halloween! To mark the occasion, a series of Halloween themed links - feel free to leave your caption competition entries in the comments section. ... whilst the Economist highlights the degree to which the occasion is more popular than ever. 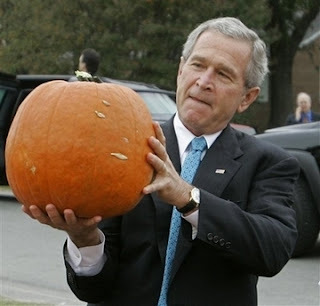 Joe Queenan, writing in the New York Times, offers up a tribute to Halloween: "Unlike holidays that have been commandeered by patriots or religious sects or people whose descendants came over on the Mayflower or Nascar enthusiasts, Halloween is not jingoistic or preachy or contrived, has no political subtext and is not rooted in greed." And AMS's Sarah Churchwell attempts to explain the rules of Halloween in The Guardian. But it isn't universally popular: the Herald Tribune examines the Catholic Church's opposition to Halloween celebrations in Mexico. There's been much mixing of Halloween and politics this year: the Republican National Committee has asked people to vote for the Scariest Democrat; the Associated Press and Ipsos have asked which presidential candidate would make the scariest Halloween Costume (reported by the Gothamist). Hillary Clinton fares well in neither poll. And finally: find out what to do with the bits left over from your carved pumpkins. If you're doing anything for Halloween this year, we would love to see some pictures. This month's Broadview features a special focus on developments on new developments AMS. Click on the image above for a larger, readable version of the article. 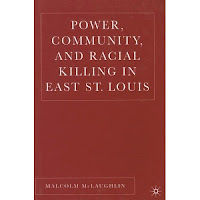 Following last week's public lecture, AMS's Malcolm Mclaughlin, author of Power, Community and Racial Killing in East St. Louis, will be speaking at this week's research seminar. He'll be talking about "The Pied Piper of the Ghetto: Lyndon B. Johnson, Environmental Justice and the Rat Extermination Bill of 1967." Wednesday 24th October, Room A2.51, 4pm - all welcome. The cause of Edgar Allan Poe's death in 1849 has long been one of American literature's most compelling mysteries. Now, author Matthew Pearl thinks that he might have found the answer: a brain tumour. Read the whole story in the Observer. As part of the events celebrating Norfolk Black History Month, AMS's very own Malcolm Mclaughlin is giving a public lecture tonight: Elizabeth Fry Building, 6pm. 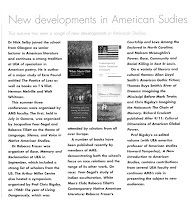 The American Studies Year Abroad Programme is featured on the cover of the latest issue of the Faculty of Arts and Humanities Newsletter. This week's research seminar will be held on Wednesday at 4pm in A2.15. It's going to take a different format than normal research seminars: a research roundtable, it will feature PhD and MA students discussing their research with each other and with faculty. All are welcome. This week's year abroad memories come from Alexia Smith. Alexia studied at Carleton University in Ottowa, Canada. 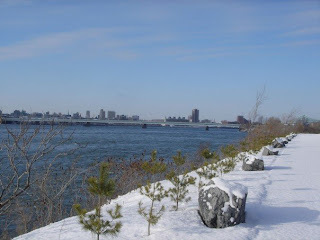 "This is a view of Montreal, where we went for Christmas and New Year. The photograph was taken from one of the city's islands, which was home to a famous race track and casino. It was utterly beautiful, and well worth the journey through ice-rain!" "The next picture was taken at a hockey match we went to - Canadians are obsessed with hockey! This was an Ottawa 67's game, who are in a slightly younger league than the NHL. We had a great time though. It was even better than the NHL game we saw. The whole crowd was really into it. 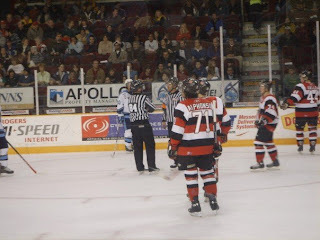 The 67's won, which was good, and it was a great match." 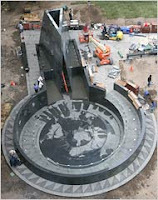 Sixteen years after the rediscovery of the New York African Burial Ground, a National Monument commemorating the site was officially opened last Friday. In use for approximately a century from 1690-1790, the cemetery is thought to have been the final resting place of approximately 15,000 Africans and African-Americans. Find out more about the cemetery and the opening ceremony courtesy of the New York Times, the Voice of America, and the New York Public Library. "On my year abroad in San Francisco, I took an internship at 826 Valencia, San Francisco's only independent Pirate Supply Store. Originally I did it to get a visa extension (who wouldn't want an opportunity to stay in SF as long as possible? ), but it ended up being the focus of my second semester. As well as the store front, which sells compasses, spare peg legs, hats, eyepatches, glass eyes, lard, and everything else the working pirate needs, 826 Valencia is a non-profit writing workshop for kids aged 8-18, set up by author and publisher Dave Eggers in 2002. They run various free programs in 3 main areas: in-schools programs, where volunteers go into a local school to work on existing projects set up by teachers, everything from checking and helping with college entrance essays to writing Shakespearean sonnets (I have a thank-you note with a picture of me as William Shakespeare from one kid); field trips, where up to 30 kids come into the workshop to create a book in a 2-hour session; and after school homework drop-in, which also serves as a free childminding service for parents who can't get out of work to pick up their kids. The workshop is in the middle of the Mission district, a largely latino/hispanic area, and focuses on working with kids from immigrant families, especially where English isn't a primary language. themselves. Another volunteer, usually a local artist, brings the characters to life on a drawing board at the front, and after two or three pages have been completed in the group, the kids are given paper and pencils, and each one has to finish the story by themself. While this goes on, interns and volunteers take the completed pages and illustrations, photocopy them and collate them together, and when a kid has finished, the book is bound there and then in the workshop. Now, as well as the leader, artist and typist, there's one other person who helps out with the field trips, and that is the terrifying Mr Blue. Mr Blue is a cranky old publisher, who lives in the attic above the workshop, is never seen, and has read everything ever written by anyone, ever. This ensures all the characters are original, and there's no Spongebobs or anything else like that. He periodically shouts down at the kids and generally grumbles about the state of the stories he has to read. At the end of the session, all the finished books get sent up for his approval. Amazingly, he is blown away by the quality of writing, and each book gets his stamp of approval. I spent many happy mornings hiding up the ladder shouting at children. The photo above (which is on the 826 Valencia homepage) was taken on my first day working there. They put me with Arkangel, who I later learned was one of the big initiation rites for volunteers - he was very easily distracted! All he had to do was sit and read to me a chapter or two of his book, but he managed to find a million little distractions. So, since his book was about pirates, we popped into the pirate store up front, borrowed a couple of hats and an eyepatch and bingo! he's reading and happy. In my time there I got to meet Dave Eggers, Valentino Achak Deng (the inspiration behind What Is The What) and a whole load of writers, journalists and generally inspirational Bay Area creative minds, a large number of whom were under 18. Other highlights included the summer writing camp, a week-long program for high school students, where I got to know some of the kids really well, and who I hung out with (I'm not ashamed to say) at the Harry Potter final book launch midnight party." Videos from the archives of the Arthur Miller Centre for American Studies International Literary Festival are being made available on-line. The authors featured in the interviews and readings form a veritable who's who of contemporary writing, and these videos are an invaluable and recommended resource. At present, featured guests from 2006-present are available here; from 2000-2005 here; and from 1991-1999 here. This semester's research seminar series begins on October 10 (4pm, 2.03): Graham Thompson, author of American Culture in the 1980s, will be speaking about "American Products and Cultural Forms in the Long 1980s." All are welcome. Postgraduate AMS students should also note that on October 17, the research seminar is being given over to a Research Roundtable, a chance for all of our PhD and MA students to discuss their research with each other and with faculty members. See you all there. The next UEA Open Day is this Saturday, October 6. If you're coming along to find out more information about American Studies, we look forward to meeting you! 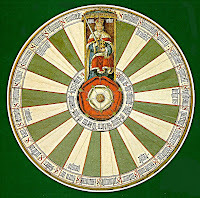 News: What's the Matter With College? The New York Times has revealed the winners of its student essay competition, all of which are available to read online. Entrants were asked to write in response to Rick Perlstein's essay, "What's the Matter With College?" Could you have done a better job?